Hello again. Before heading out, I just want to share this DIY Lipstick Palette. Last month, I was on the verge of throwing out lipsticks because my stash is too cluttered. I rarely use these lipsticks. Then, I realized that I could still keep them by turning them into a palette. I bought this medicine/pill box from Beabi for only 40 pesos. Beabi is the best place to go if you are in the looking for reasonably-priced and multi-functional travel and storage bags and containers. 1. Scrape off your lipstick and place the lipstick on a spoon. 2. 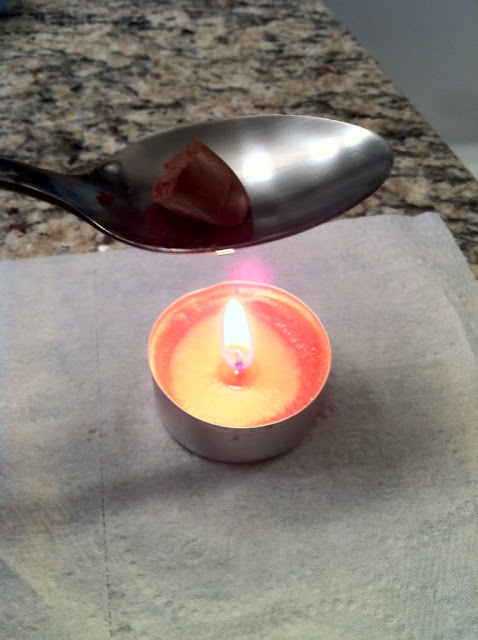 Place the spoon on top of direct heat. I used a candle for this. 3. Then pour the melted lipstick on a container of your choice. It was really quick and easy to do. However, be careful with the melted lipstick. My lipsticks were popping when they reached the boiling point! So what are the lipsticks I used in this palette? So what I meant about pipitsugin are the cheap lippies I have like Ever Bilena, ELF and Aido. When I melted the lippies, their colors showed beautifully. This is perfect for those who loves to travel and loves to bring tons of makeup like me. I need not worry bringing a lot of lipsticks when I can bring six colors in one container. In fairness! I like this! Cool! How do you apply them, with a finger or with a brush? I'm gonna try this. Hehehe.